The second Romanitas book, “Rome Burning”, ended on a huge cliffhanger so I was keen to see how it was resolved at the beginning of the concluding book in the trilogy. The resolution of the cliffhanger didn’t turn out exactly as I expected it to and the first chapter dealing with this is one of the best and most powerful in the trilogy. The rest of the book follows the aftermath of those events and it does cover a lot of different plotlines ranging in scope from two characters trying desperately to hide from the authorities while travelling across a continent (a plotline McDougall likes so much that she seems to use it at least twice in every novel) to a World War between the two empires of Rome and Nionia (Japan) while ever-present in the background is Una, Varius and Sulien’s determination to abolish slavery in the Roman Empire. There are a lot of potentially interesting plotlines in the book, but some of them are more successful. 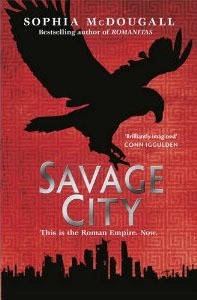 The series has tended to be at its best when it focuses tightly on a small number of characters and this is true again here with the scenes of characters in captivity or on the run among the most effective in the book, particularly in the mid-novel scenes where there are attempts to save a character from being executed in the Coliseum. The Coliseum scene and the trial preceding it is perhaps the highlight of the book. The book isn’t quite as assured when it comes to the storylines involving the war. It struggles to really convey what is happening in the war as a whole and what we see of the overall strategy is sometimes unconvincing while the ordinary legionaries conscripts that play an important role in the second half of the book seem a bit shallow compared to some of the other characters. The war storyline is at its best when showing the claustrophobia of living in a city under aerial bombardment, probably because it allows McDougall to focus on the pressure it puts on the characters. The world-building continues to be a bit vague, although there are some nice touches such as the Pharos Lighthouse and Great Library still standing in Alexandria and various characters’ confusion at encountering an obscure religion in Ethiopia which uses a cross as its symbol. The ending of the series is satisfying, although some elements of it do seem a bit rushed and slightly too easy. The bittersweet epilogue is also good at showing that even in victory the impact of the war doesn’t go away. The characterisation has generally been the strongest part of the series and I’d say that largely continues here despite some occasional issues – Sulien can be a frustrating character to read about and even he seems puzzled by some of the things he does while Drusus continues to feel a bit of a cliché of a self-centred despot. The novel does suffer a bit from the lack of Dama, who was probably the most intriguing character in the first two novels but Una and Varius continue to be interesting characters. Overall, this is an entertaining conclusion to a series that has always been a bit uneven but has enough good points to be worth reading.